Ready Player One takes place in the year 2045, and humanity is addicted to a shared virtual reality known as OASIS, which is chock-full of references to movies like Jurassic Park and video games like Minecraft. But bizarrely, there's nothing new. Really? There are no iconic pieces of entertainment made between now and 2045? That's 27 years! That's like living in a 2018 where no one references any pop culture from before 1991. 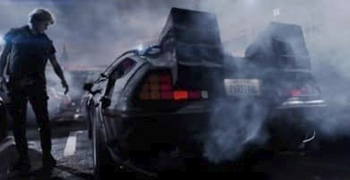 To put things in perspective, our main character races around in a digital DeLorean from 1985's Back To The Future. That'd be like if today's gamers were modding their avatars to look like Buddy Holly and the Big Bopper. The real suspension of disbelief is that in 27 years, no one will remake that movie and sour the brand. Even more confusing than the culture of this world is the technology of this game. At one point our hero, Wade, upgrades to a full-body suit and then goes dancing at a virtual nightclub. So how is he doing this? He's not holding a controller, and the suit doesn't plug into your cerebral cortex. Wade is sitting in the back of a filthy van, but in the game, he's somehow able to go full Saturday Night Fever. The suit also allows users to feel things, like a rumble pack for cyber-groping. But most insanely, shelling out the big bucks for one of these fancy rigs also means that if you get kicked in the balls in the game, the suit will simulate that agony in real life.